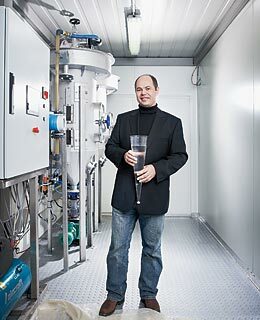 Achim Kopmeier with waste water treatment plan "ExSep 500" . Water-treatment engineer Achim Kopmeier had grown frustrated with an industry that was "totally inefficient" at separating solids from wastewater. Determined to find a better way, he laid waste to the garage, "splitting up plastic things" until he had his result: a cone-shaped pipe that uses 10% of the area and considerably less pumping energy than do the classic pondlike settlement basins used in sewage treatment today. Thus marked the beginnings of Epuramat, an 18-person Luxembourg-based company that Kopmeier, 41, founded in 2005 with David Din, 43, a former banker. Epuramat calls Kopmeier's invention ExSep (for Extreme Separator) and sells it to companies that reuse water for industrial processes. Another product, Box4Water, houses an ExSep in a shipping-container-like vessel. It can serve traditional sites, disaster locations or areas with no water infrastructure  and provides a drop of hope to billions of people who don't have access to clean water.